The Academy is teeming with talent being used in extraordinary ways. Chances are you’ll miss it if you don’t look closely – especially if you’re not prone to looking down at your feet. Senior Sarah Lockard shows off her artistic aptitude with a stellar pair of shoes. The fancy footwear Lockard now dons regularly was made in tribute to the hit sci-fi show Star Trek – specifically one the most recent series Star Trek Voyager. 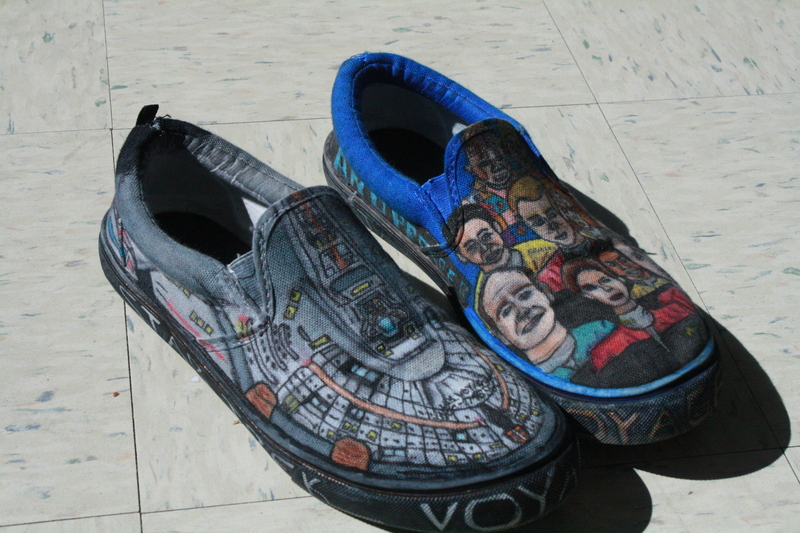 The left shoe features several characters from the show, while ¬the right has a detailed drawing of the USS Voyager, the spaceship where the series takes place on. “I made them mainly to show them to Robert Picardo,” Lockard said. She watches the show because of Picardo, who played The Doctor on the show, and hopes to show them to him at the Star Trek Convention in Las Vegas next year. The fun shoes were neither a simple, short, or cheap project. It took her about 20 hours to complete the shoes. She spent about $275 gathering the materials, which primarily included her main medium: Copic Markers. Lockard said the markers blended nicely on fabric and act similarly to water colors. Aside from Copic Markers, she also used Sharpies and colored pencils. Lockard’s artistic skills didn’t come to her easily. It took years of practice for her to become as proficient as she is. “Even in 8th grade I still wasn’t a good artist,” she said. That changed when she developed an interest in actor Rex Harrison and drew his image. From there, she realized her specialty was portraits. “I started being able to recognize the proportions of different things. My visual interpretation and ability to see things and put them on paper increased,” Lockard said. As for her shading skills – and general adeptness in art – she credits former ASK project manager Edgar Short. Lockard’s has some advice to anyone hoping to create cool kicks. “Sketch it out first in pencil,” she said. “Use a medium that you feel is going to be best for your skills.” Also, don’t rush through the project. Sarah said she hasn’t done any other projects like this, whether it be just shoes or more “trekkie” crafts. “I want to do more shoes on different topics.” Her next pair of shoes might feature classic actor Cary Grant. “Or old films, like My Fair Lady,” she said.